Fine and Fair: LGBTQ Pride: Child-friendly and Age Appropriate? LGBTQ Pride: Child-friendly and Age Appropriate? We recently attended our local annual LGBTQ Pride event, as we do nearly every year. This was Delilah's second year joining us at Pride, but the first year when I was asked by several people whether such an even was appropriate for children. My answer was, of course, a resounding "yes", as I wouldn't be bringing her to an event that I thought wasn't appropriate for children. Her rainbow dress was a big hit! Our local Pride event includes some children's activities, a play area for children, and plenty of family-friendly entertainment. Most of the more adult-themed entertainment starts at Delilah's bed time. I've never even questioned it as a family-friendly event until people questioned me on it. I made it my mission to determine just what might be so controversial about bringing a child to Pride and to approach it with an open mind. As we made our way toward the gate, I noted the protesters that show up every year and wondered to myself if exposure to their judgement and condemnation of a celebration of love could be considered inappropriate for children. I saw it more as an opportunity to affirm our own values and beliefs on such matters, should such questions arise. As we entered the event, a young man, emboldened by the protesters, had approached the gate and referred to some of the women working the entrance as "dykes". Perhaps such offensive language was inappropriate for Delilah to hear, but then she got to hear one of those women calmly and rationally defend herself and explain why the word was offensive, and hear the man apologize and then say she seemed like "a very kind lesbian" after engaging in a conversation of whether or not she was "born gay" (verdict: she was). Once we passed through the gate and were received by the smiling faces and friendly greetings of various vendors and information booth attendants, I figured we were in the clear. Delilah was fascinated with some of the colorful and creative costumes in the crowd, and basked in the attention and compliments she got on her rainbow dress. 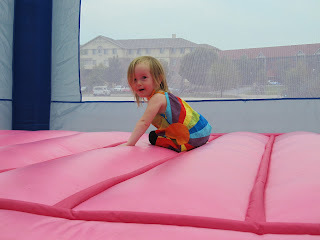 She enjoyed the activities in the children's area and was particularly drawn to the live music performances. At one point, we made our way toward the main stage and I noticed that a performance by drag kings was taking place. When Delilah pointed at a woman in drag and announced to me "Boy", it occurred to me that perhaps this blurring of gender lines might be seen as inappropriate to some. For me, it presented a teaching moment, an opportunity to keep an open dialog about gender roles and expectations, and to affirm my acceptance and celebration of individuals everywhere on the spectrum of gender identity and presentation. Perhaps to some, children seeing two men or two women embracing as they swayed to music together, or holding hands as they made their way through the festival, or kissing or otherwise showing affection for each other is not age-appropriate. Delilah didn't question it, and I didn't draw attention to it. If she had asked why those two men or those two women were kissing, I'd answer simply and honestly "they love each other like mommy and daddy do." In the end, I left feeling affirmed in my position that Pride events are family friendly and appropriate for children, assuming their parents are willing to offer guidance and answer any questions that might come up. We will continue to make our local Pride festival an annual family tradition to celebrate diversity in general, and the LGBTQ community specifically. As a queer woman partnered to a straight man, we always go to pride. Our 4yo daughter goes too. I believe it is very important for her to know that we love, celebrate, and embrace diversity. I too have been asked if its appropriate, and wholeheartedly agree that it is. I love this! Thanks for sharing, and for letting your child grow up seeing love and respect for all people. The dress is awesome!